As I wrote before, by default when you setup assigned access the UI only shows app which have the aboveLockScreen extension registered. I talked to the PM who owns this feature to ask why and the reason is because we changed the behavior of how assigned access works (lock the screen and launch the app above the lock screen) we found out a lot of existing apps crash when running on the lock screen, so we changed the UI to only show apps which are designed to run above the lock screen. Although the UI might not show your existing apps anymore you used to run as kiosk app, you can still use those. Obviously you need to test if they work when running above the lock screen. Besides using MDM or a provisioning package to configure assigned access you can also use PowerShell to setup your app to run. You can find the documentation over here. You will also find interesting documentation how to setup auto login and how to make a classic windows app the default app on that page as well. 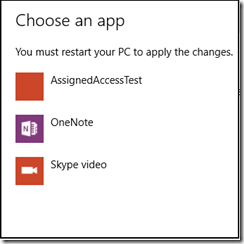 This experience is something MS wants to improve in the future but for now you have to use this trick to setup your old app as assigned access app. Another one of these little ‘gotchas’. Morten asked the question why he couldn’t debug DirectX on mobile, but it was possible on desktop and the IOT version of windows 10. I am not a DirectX expert at all, but this was weird. So I asked around internally what was going on. First, if you want to do this on Desktop you need to install the graphics tools as an additional feature before you can do this. btw, you can also use ALT-F5 on desktop and make Visual Studio install the graphic tools for you. 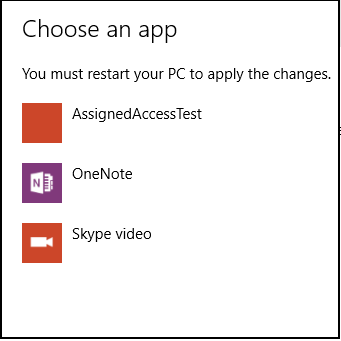 Why do I only see OneNote and Skype when setting up assigned access in Windows 10? edit; this now just works for any application in the latest version of Windows 10. So the manifest is not needed anymore. 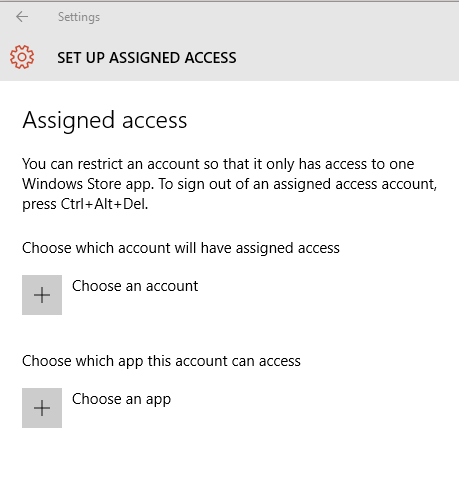 If you are trying to setup assigned access in Windows 10, you go to settings, accounts, Other Users and there is a link to ‘set up assigned access’. 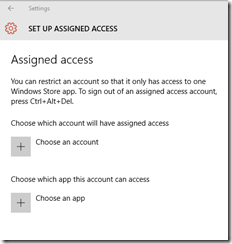 First you need to create a local account you can use for assigned access. You can do that at this ‘Other users’ dialog as well. On the Assigned access page you can choose an account and the app you want to run in ‘Kiosk’ mode. The thing is, it only shows 2 apps in my list, OneNote and Skype Video, where are the rest of my apps? The following is a sample application manifest, you can see the windows.aboveLockScreen uap extension. You must use this extension in your Windows 10 Universal Windows Platform (UWP) app in order for it to display in the Assigned Access app list in Settings. It will show up in the list as well. One of the things my Home Automation app needs to do is run forever. But I don’t want the screen to burn in either. I can allow the phone to lock the screen but at that time my app isn’t running. I could run some background tasks but there is no way to wake up the app and dismiss the lock screen automatically. Therefore I want an app which runs all the time but has some kind of build in screensaver. First of all I need the app to prevent the lockscreen appearing. I can of course also configure the phone never to show the lockscreen, but I can also solve this in code. It took me some searching and help at twitter (thanks Neil) to figure this out. The useridlemode from Windows Phone isn’t there anymore. You now need to use Windows.System.Display.DisplayRequest(). So when trying to figure out how to determine how long a user is inactive I could only found some win32 API’s. Unfortunately these don’t work on Windows 10 Mobile (the ones I need that is). So I decided I needed to add a timer on every page. Whenever a user does something on the screen I reset the timer. If the timer fires I navigate to the screensaver.xaml page (and do the screensaver magic) and when the users hits the screen the app will return back to the MainPage.xaml. The constructor creates a timer (in this sample set to 5 seconds). Whenever the timer fires I redirect to the Screensaver page. Whenever PointerMoved event is fired the timer is reset. I found out that with the PointerMoved it works on desktop and mobile. You might need to add more events to make it foolproof, but for my scenario on the phone it works. You can find the complete solution over here. Of course after I build this Morten Nielsen posted on Twitter he already build a solution. I think his solution is much easier to use. // Resets the timer and starts over. What happens in the Screensaver code behind is a timer is started. Whenever the timer ‘ticks’ the popup with the screensaver is shown. A tap on the screen removes it again. Every time something happens on the screen the timer is reset. This works really well and you don’t need to modify every single page. So I think I will end up using this solution instead. You can find a complete working sample here. As I described before I am working on a little project to use some Lumia 640s in the house to control the home automation. Besides figuring out how to configure and roll out the devices, and figuring out how exactly I am going to put them in the walls, I also have a laundry list of items I need to figure out for the app on the device. Instead of waiting before everything is done I thought it might be useful to take you along the ride. It might even result in some people mentioning to me some of the things I need to figure out are already out there. So this is the current list of ‘issues’ or tasks I want to figure out before bringing everything together in an app. Other device discovery to connect to for the walkie-talkie functionality etc.